I’ve drunk two Spanish reds in the past week and, coincidentally, they’ve both been 100% Monastrell. How odd is that? Maybe no longer odd at all, given the growing trend among winemakers in Spain’s hot and arid southeastern region to bottle Monastrell unblended. Traditionally a blending grape in the Rhône (for reds) and Provence as well as in Spain, Monastrell (aka Mourvèdre) characteristically yields wine that is vibrantly fruity, tannic and high in alcohol. Reds of such weight and intensity are not everyone’s choice for August drinking. Not so for me, however, as daily life presents such a spectrum of moods, meals and occasions that I can’t restrict a wine to a particular season. 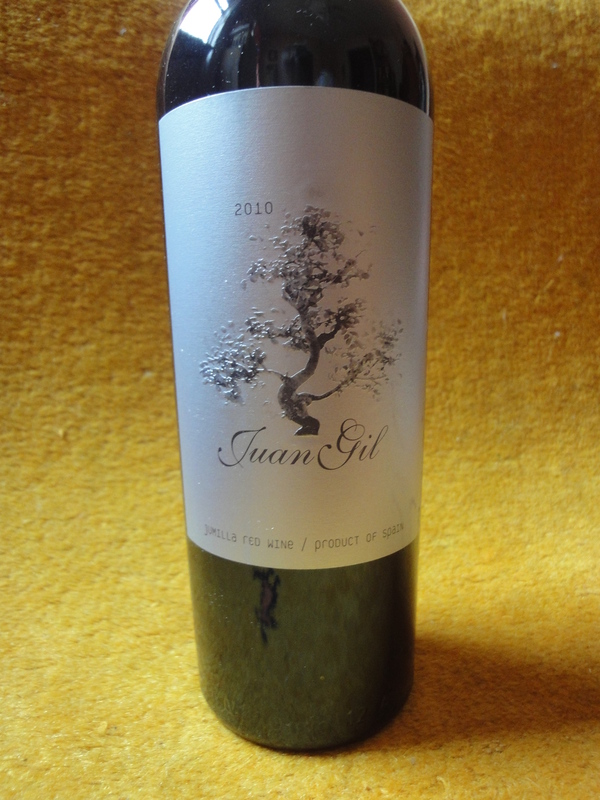 Juan Gil Monastrell 2010 – I love this wine! I originally found it at Giannone Wine & Liquor soon after it opened its Hoboken store earlier this year ($13.50). I’ve subsequently seen it at Hoboken Vine and Jersey City’s Buy-Rite ($13.99). The grapes for this wine are cultivated in Jumilla, in Murcia province, under extremely dry growing conditions. The wine is aged 12 months in French barrels. This Monastrell drenches the mouth with intense red fruit. Not a subtle sipping wine, the Juan Gil provides a dense immersion experience. Vinos Sin-Ley “M” 2011 – Basque-style tapas restaurant Tertulia in Greenwich Village was featuring this wine by the glass last week – at $15 a pop, unsurprisingly overpriced (given that a bottle retails for the same or slightly lower amount). “M” is produced in Yecla, a town (and D.O. ), also in Murcia, that abuts Jumilla. This expression of Monastrell is less dense and less fruity than the Juan Gil, nevertheless a versatile accompaniment to flavorful Spanish dishes. This entry was posted in Shopping, Tasting and tagged Juan Gil, Jumilla, Monastrell, Murcia, Vinos Sin-Ley, Yecla. Bookmark the permalink.